at the professional, community, college/university, and high school levels. The original postmark deadline for The American Prize, 2013, for conductors and their ensembles is Monday, March 18th. POSTMARK DEADLINE EXTENSION: Applications will be accepted postmarked through Thursday, April 4, 2013 for those who need more time. Applicants expecting to meet the original March deadline need not email in advance. Among applications already received for the 2013 competitions are many from TAP laureates who previously applied and have decided to enter again. It is gratifying that these special competitions, which offer reward and recognition based on recorded performances (there is no live competition) appear to be finding a unique place in the nation's artistic life. If you're a performing artist or lead an ensemble, you have recordings. The American Prize wants to hear them. 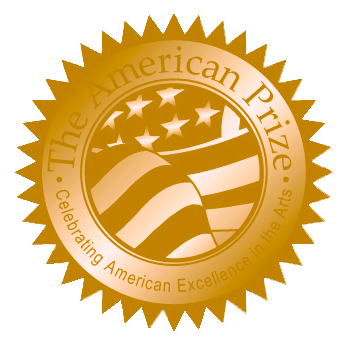 The American Prize is unique—the only national, nonprofit competitions in the performing arts based solely on the evaluation of commercial and noncommercial CD and DVD recordings of performing artists. The American Prize has awarded more than $10,000 in prize money since 2010. • Multiple divisions for professional, college/university, community, high school age musicians. Postmark Deadline Monday, March 18, 2013 / extension to April 4th. • Send bio and photo by email. • Send CD, DVD or VHS tape by mail. All applications are acknowledged upon receipt. • No live competition. Contestants are judged solely through their recorded performances. • Separate categories for professional, college/university, community and high school musicians. • Written evaluations provided to all finalists, runners-up and winners from our distinguished panel of judges. • Published timelines for the announcement of semi-finalists, finalists and winners. • Not for profit organization. This additional opportunity is offered as part of The American Prize in Vocal Performance / Friedrich and Virginia Schorr Memorial Awards national competition and is open to 2013 applicants in the professional and college/university categories, only. Each winner will receive a $500 all-inclusive fee (no additional housing, travel or per diem), payment to be made on the day of the performance. Although the Chicago Oratorio Award is an additional contest open to all professional and college/university applicants for The American Prize in Vocal Performance, 2013, it is geared primarily to those who live within comfortable travel distance of Chicago and who can make their own housing arrangements.